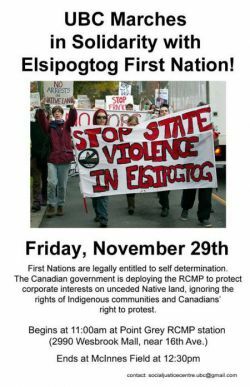 First Nations are legally entitled to self-determination. The Canadian government is deploying the RCMP to protect corporate interests on unceded Native land, ignoring the rights of Indigenous communities and Canadians right to protest. Begins at 11:00AM at Point Grey RCMP station (2990 Westbrook Mall, near 16th Ave).